Taken from the inspiration of Simon Sinek, “Start with Why” Management Systems International (MSI) exists to increase Companies’ value towards greater Excellence. As a corporate buyer, and like most of us working in industry, we want to make a difference in how suppliers deliver. We strive to consistently improve quality and make an overall difference in our environments. Growing and successful companies work with MSI to develop their internal processes systematically to meet International Standards of Excellence and improve their value and peoples’ lives. Submit info on our RFI form, to get implementation strategy and budget analysis (complimentary). MSI powers forward service, government, aerospace, defense and manufacturing companies of any size by helping to critically meet international standards. When you choose us to expertly implement your quality and environmental systems, we ensure you continually achieve ISO or AS certification for a breadth of profitable benefits. 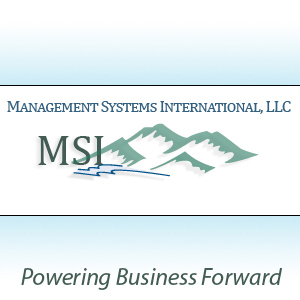 Founded in 1998, MSI employs an industry-leading team of highly qualified and experienced consultants and trainers who provide synchronized and superior service. In turn, we have enabled more than 600 companies to reach certification. Whether we are providing in-person service and training throughout the United States, or online from our San Diego facility, we tirelesslyrealize our vision and fulfill our mission for your long-term success. MSI improves companies’ performance and employees’ lives by innovatively developing and maintaining management systems that deliver strategic and continuous improvements for companies in pursuit of operational Excellence and for industries in that excellence is a must. Making a Difference in the World! Demonstrating leadership, integrity and ongoing excellence, we provide management systems as a platform for international standards certification that positively impacts companies and their employees. In short, we power business forward through ISO or AS certification. MSI assists customers to realize the benefits intended by the ISO Standards. Direct outputs over time are: improved operational effectiveness, customer satisfaction, continual improvement and an understanding of environmental impact. Successful ISO registration is the beginning in customers gaining these benefits. Processes and services are continually improved to provide leading, accurate, and professional services. at the same time improving the company’s environmental performance through the prevention of pollution and the protection of the environment and thereby providing a unique advantage to our customers. Our intent is to meet or exceed requirements including legislative and local regulations at every opportunity by continually improving the effectiveness of not only our own Integrated Management System, but also the effectiveness of our customers’ Management Systems. What is an ISO Management System? A management system is a proven framework for managing and continually improving your organization’s policies, procedures and processes. MSI has established well over 65 of these systems for leading companies and Diana Procter has led each project. We started focused to the Environmental ISO Standard 14001, as it had just been published a couple of years prior to MSI’s beginning. We all have a passion for preserving and making better the environment. All of us wanted to improve the quality of our lives by providing better for our families.